Argan oil here, argan oil there. Taking the personal care industry by storm! It seems like numerous products out there are infused with it but how many facts about Argan oil do you really know? With so many usages and benefits it’s no wonder that everyone is jumping on the Argan oil bandwagon these days. We’ve put together a list of nine surprising facts about this miraculous oil we bet you didn’t know! Argan oil is NOT oily! In fact, it is extremely effective in combating oily skin and scalp, as it contains linoleic acid. A type of omega-6 fatty acid that controls sebum levels that are responsible for breakouts, oily skin and hair. Not all Argan oils are made equally! Why? Due to the rarity and limited supply of Argan oil itself. Another reason is the different extraction methods: handmade vs. machine, new vs. old nuts, cold-pressed vs. not, diluted vs. pure, and certified organic vs. conventional and the list goes on. These details are what differentiates the fake and bad from the good and premium Argan oil. Read more on what to look for and avoid. It can be used as a massage oil. Pure argan oil can be used during massage to help relieve arthritis and rheumatic pain. The anti-inflammatory properties of Argan oil help in relieving aches. “Argan oil” and “Moroccan oil” are 2 completely different things. How so? That’s an intriguing fact about Argan oil a lot of people ask about. Pure Argan oil is a powerful moisturising and healing dry oil for hair, face, body, and nails. “Moroccan oil” is the name of a brand with products infused with Argan oil and other chemicals. When searching for the best oil for your hair and skin, look for the liquid gold and nothing else. Make sure to read the label’s ingredient list! It has medical benefits, too. Pure Argan oil has helped many people suffering from conditions such as eczema and psoriasis. Due to its high content of anti-inflammatory properties and vitamin E, it can also help heal rashes and dry flaky skin. It is an extremely rare oil. Another very surprising fact about Argan oil! It takes approximately 30 kg. (66 lb.) of Argan fruit and about 24 hours to produce just 1 litre (1 qt.) of Ayelli Pure & Organic Argan Oil. The oil is extracted from the precious Argan tree (Argania Spinoza), which is only found in a small region of southwest Morocco, making it one of the rarest oils in the world. The Argan forest is a UNESCO World heritage. Goats love Argan! That’s usually the most surprising fact about Argan oil for most people. 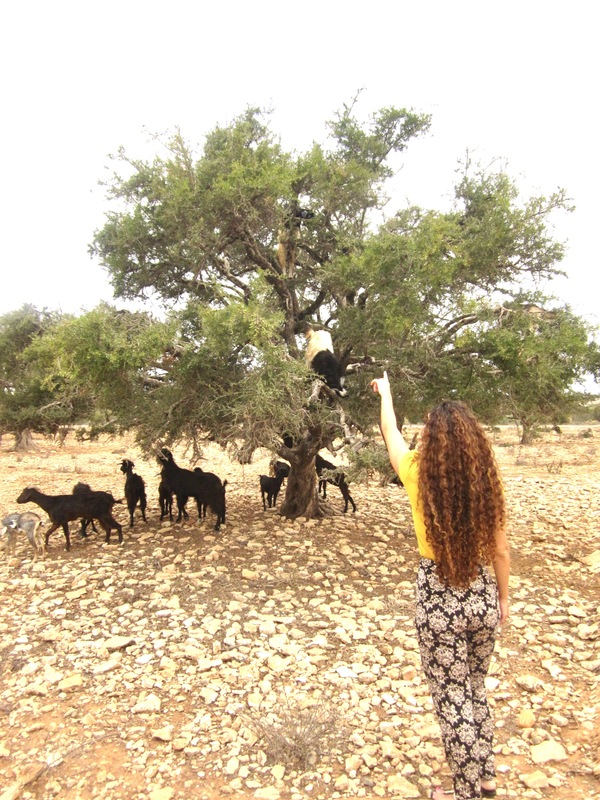 Goats climbing on Argan trees make the cutest pictures for tourists. It is fascinating to see them standing gracefully on the tiny branches, but the reality is that they are very damaging to the tree and add to its speedy extinction. In addition, the Argan oil extracted from the nuts goats’ excrements (they love to eat the fruit) is of a very bad quality. This type of widely common Argan oil needs to be deodorised which destroys its natural moisturizing and healing properties. In order to protect the quality of the oil, the Argan nuts need to be harvested with the pulp/skin still on. The oil should not be deodorised or bleached. Our Argan farm is goats free! It’s a complete treatment. Due to its wide usage methods and benefits including moisturising, anti-aging and repairing, Argan oil can replace a very wide range of beauty products from cleanser to leave in conditioner. These facts about Argan oil may be surprising and new to you but pure Argan oil has been used for centuries in Morocco. It is a powerful natural beauty product and its results on skin and hair are no surprise. We offer organic certified Argan oil–entirely vegan, not tested on animals, free of any nasties, and sure to improve and refresh your skin and hair! Which of these facts about Argan oil surprised you the most?Comment below and share this article as a subscriber and you will receive our ultra-hydrating Argan cleansing bar worth $19 for FREE* Sharing is caring! Let’s chat! Excellent healing properties, it healed those bad sandfly bites I got from Bali that no other oils could. Also heals new sun spots well! You can use it on babies too! I’ve used mine for a while heaps of baby skin / hair treatments and it worked wonders as long as it’s pure. It’s incredible all the uses of argan oil and how important to the quality is the production process. I absolutely love that just a few drops are enough. Ayelli’s Argan Oil is such a miracle product that it is now at my bedside during all the seasons. With this oil, I feel myself like a new-born baby with a softened skin and body. Also I am using it on my hair and it has become more powerful and treated. All those positive effects of this argan oil is firstly because of taking pain over your job and also your production process and customers’ happiness. Thanks a lot! Wow! Thanks Gamze! I’m glad you love our pure argan oil and see its repairing and strenghtening results on your skin and hair. Our customers happiness is our happiness. Thanks for your love! !